AzhwAr had shown the extreme limit of simplicity – emperumAn lying at SrIrangam temple, as periya perumAL. Despite that, samsAris were not showing any involvement with periya peumAL. He feels sad that despite telling them that the same SrI rAma who he had earlier (in pAsuram 7) pointed out to them for taking refuge under, is now lying in SrIrangam to help them, the samsAris, instead of reciting his names, are wasting their time. கருவிலே திருவிலாதீர் காலத்தைக் கழிக் கின்றீரே. oru villAl – with the help of a bow that he could lay his hands on, he blocked the ocean. But wasn’t the ocean blocked with stones? How is it that AzhwAr says that SrI rAma blocked it with a bow? 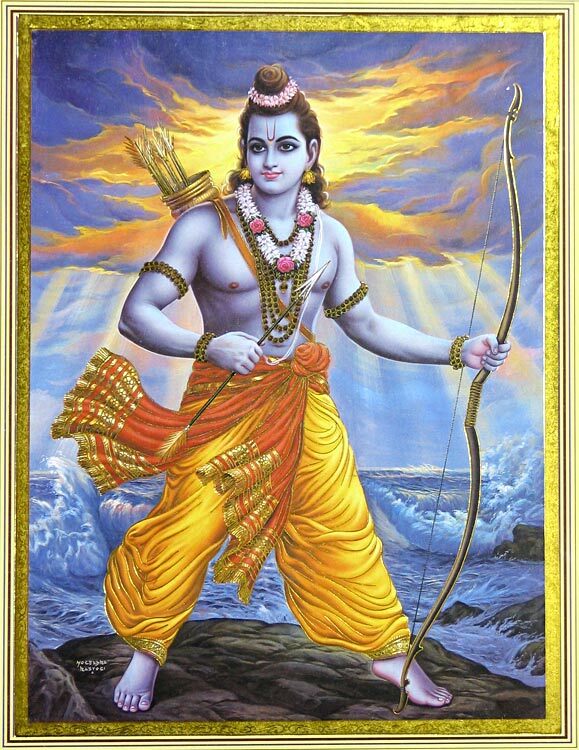 When it was decided to build a dam across the ocean, SrI rAma surrendered to samudhrarAjan (king of ocean). But when the king of ocean did not appear even after 3 days, SrI rAma told lakshmaNa “chApamAnaya soumithrE SarAmSchAShI vishObamAn I sAgaram SOshayishyAmi padhbhyAm yAnthu plavangamA: II” – hEy lakshmaNa! Bring the bow and arrows which are like poisonous snakes. I shall dry up the ocean. The army of monkeys can walk through the ocean bed. After lakshmaNa brought the bow and arrows, SrI rAma drew the bow and was about to shoot the arrow when the king of ocean appeared. Thus AzhwAr says that with the help of the bow he created the dam. ongu munnIr – turbulent ocean. It is not the natural turbulence in the ocean that is referred to here. On seeing Sri rAma with the bow and the way he stood with a courageous stance, the ocean felt shaken and thus became turbulent. The king of ocean did not appear when emperumAn surrendered to him. Only when he took the arrow did he appear. It is similar to children in school bowing to the class teacher when he takes the stick. vAlmIki bhagavAn describes the anger of SrI rAma “samudhrasya thatha: krudhdhO rAmO rakthAnthalOchana: I” – rAma, because of his anger towards the king of ocean, was red in his eyes. adaiththu – only after SrI rAma let go off a few arrows did varuNa appear and begged SrI rAma to build the dam on his back.. Hence AzhwAr says, he blocked the ocean with bow and not with stones. Without the backing, the mountains which were thrown into the ocean by the army of monkeys would have sunk and the dam would not have been built. ulagangaL uyya – For all the worlds, including earth, nether world, svargam (heaven) and anthariksham (world between earth and heaven) to live in comfort. When rAvaNa was alive, these worlds were in disarray due to the strength of the boons that he had obtained. It was only after his death that these worlds became liveable. SrIvishNu purANam 1.13.14 says “na yashtavyam na dhAthavyam na bhOgthavyam kathanchana: I” – at no point of time should there be yagyam (a form of worship) or donations or hOmam (ritual with agni, or fire) was the order during rAvaNa’s time. He conquered all the worlds with his strength and power and made the worlds almost unliveable. Another way of interpreting is “ulagangaLuyya munnIr adaiththu” – for the worlds to live in comfort, he blocked the ocean. “sEthum dhrushtvA samudhrasya gangA sAgara sangamam I brahmahathyA vimuchyathE mithradhrOhi na muchyathE II” – by looking at the sEthu built in the ocean [by SrI rAma] and the place where gangA joins with ocean, a person gets rid of killing a brAhmaNa, but not betrayal of a friend, goes a saying. samsAris, at all times, can get rid of their dhOshas (impurities or faults by merely looking at the sEthu (bridge)). cheruvilE – in war. Unlike the coward rAvaNa who, using a bait (the illusory deer) removed rAma and lakshmaNa from their dwelling and entering an open house like a dog and took away pirAtti when she was alone, SrI rAma engaged in war with rAvaNa and killed him. arakkar kOnai – king of demons. As thirumangai AzhwAr says in periya thirumozhi 4-4-6 “arakkar thangaL kOn pOlum” – rAvaNa was arrogant that he was the king of demons, looking at the strength of demons with him. Apart from indulging in evil acts, he gave room for other bad people too to indulge in such acts. cheRRa – destroyed. Right in front of rAvaNa’s eyes, SrI rAma destroyed his supporters who were the cause for his arrogance; he destroyed his sons; he cut off his heads one by one so that he would be able to see his heads falling on the ground, a sight which no one else would have seen, thus shaming him. This is how rAvaNa was destroyed. In SrI rAmAyaNa, yudhdha kAndam SlOkam 59.144, SrI rAma tells rAvaNa “gachchAnujAnAmi raNArthithas thvam praviSya rAthrinchararAja! lankAm I ASvAsya niryAhi rathIcha dhanvI thadhA bhalam dhrakshyasi mE rathasthatha: II” – Oh, king of demons! You have become tired in the battlefield. Go back! I allow you to go. Go to your place, recoup your strength and come back with your chariot and your bow. Sitting on your chariot, you will see my strength. SrI rAma disarmed rAvaNa completely and told him to leave the battlefield, demonstrating the extreme limit of his valour. nam sEvaganAr – our servant. He is not a sEvagan by his being emperumAn. He is a servant because he is dependent on us (parathanthran to us). If a chEthanan (a sentient entity) folds his palms together in anjali fashion to emperumAn, he forever becomes a servant to such chEthanar. nam – as said in nAchchiyAr thirumozhi 5.3 “thAy thalaiyaRRaRRu vIzhaththoduththa thalaivan” – by removing the heads of rAvaNa one by one and making them fall, SrI rAmA removed the enemy for uniting with pirAtti. In the same way he will remove our enemies too; here, the term “nam” refers to us who don’t have any other refuge. pirAtti is the recommending authority for all of us (purushakAra bhUthai). Hence if he helps her (by removing her enemy) it can be construed as helping us all. The following incidents which took place with our pUrvAchAryas is quoted to explain this term – (1) nanjIyar was listening to his AchAryar bhattar explaining this pAsuram. After the session was over, nanjIyar was thinking about this pAsuram when he saw a soldier and a lady having an argument. The soldier was demonstrating his authority to her and trying to frighten her. The lady calmly told the soldier “what can you do to me? Only for protecting poor people and ladies like me, our king is ruling this country adorning all the weapons” nanjIyar was amazed that the meaning for this pAsurtam came from a commoner. (2) bhattar was recounting to chOzha sikAmaNi pallavarAyar the SrI rAmAyaNa SlOkam yudhdha kAndam 25.33 “rAmalakshmaNagupthA sA sugrIvENa cha vAhini I babhUva dhurthdharshadharA sarvairapi surAsurai: II” – rAma and lakshmaNa were protecting the army of monkeys that had sugrIva in it and it could not be disturbed by dhEvas or asuras (celestial or demonic people). After reciting this, bhattar told them to keep remembering this incident which happened on the seashore. The audience, which included nanjIyar, pillAI vizhupparaiyar and nambi SrI gOvardhana dhAsar among others, thought of another pAsuram, in nAnmugan thiruvanthAdhi 8 “ilai thuNai maRRu en nenjE – ilangayai azhiththa kUrambanallAl” – there is no protector other than the one who destroyed lankA with his sharp arrows. Thus, for samsAris like us who have no other refuge, chakravarthi thirumagan (son of dhaSaratha, SrI rAma) is the only refuge. sEvaganAr maruviya periya kOil – the temple where emperumAn came willingly. After he destroyed rAvaNa in the battlefield and fulfilled his word to dhEvas and rushis, emperumAn came and lay down in this temple in order to help those who came after his period of incarnation. Instead of saying sEvagan (servant) the purpose of adding the honorific sound Ar at the end (sEvaganAr) is not only to highlight his glory; it is to emphasise his dedication in serving his followers here. maruviya – emperumAn’s permanent place of dwelling, with total commitment. Going beyond para (SrIvaikuNtam), vyUha (thiruppARkadal) and vibhava (places where he took various incarnations), he chose thiruvarangam which is the root for all archAvathArams (dhivya dhESams). periya kOil – big temple. The adjective big does not refer to the expanse of the temple, but considering the greatness of the place (dhivya dhESam). If the King of a country issues an order from his capital he would not think of rescinding it. In the same way, the sankalpams (solemn vows) that he takes from here makes it a big temple. What are the vows that he takes from here? We have already seen in the explanatory notes of pAsuram 3 that this place is “pavithram paramam puNyam dhESOyam sarva kAma dhuk” (gAruda purANam 11) – this place is sacred, takes the people to liberation, and fulfils their desires. linga purANam says “vaishNavAnAm viSEshOsthi vishNOr Ayathanam mahath” – there is glory among vaishNavas that this temple is a big temple for vishNu. madhiL thiruvarangam – In order to allay the fears of what will happen to the soft thirumEni (physical body) of periya perumAL, who is lying inside the temple, from his enemies, this temple has huge protective walls. Knowing the greatness of the emperumAn, weren’t protective walls raised by persons such as thirumangai AzhwAr? ennA – there is no need to trouble the body and carry out superhuman deeds. It is enough just to say a few words. There is no need to even recite his names with auspicious qualities and deeds such as nArAyaNa et al. It is enough if one says the name of the place that he resides in, namely thiruvarangam. karuvilE thiruviLdhIr – not blessed in the womb. When it is so simple to recite thiruvarangam, why did you not recite it? asks the AzhwAr. Is it because you were not blessed by emperumAn when you were in your mother’s womb? As said in mahAbhAratham, SAnthi parvam (358.73) “jAyamAnam hi purusham yampaSyEn madhusUdhana: I sAthvikas sa thu vigyEya sa vai mOkshArtha chinthaka: II” – that person who is blessed by madhusUdhanan (emperumAn) as he comes out into this world from his mother’s womb, is the person who is known to possess sAthvika (purely good) qualities and he is the one who thinks of the greatness of mOksha. It is this blessing from emperumAn when he is about to be born that attracts him towards emperumAn. AzhwAr tells the samsAris that they have lost that blessing. poigai AzhwAr and bhUthaththAzhwAr (the first two AzhwArs) conveyed the same meaning in their respective thiruvandhAdhi (of being blessed by emperumAn when they were inside the womb). kAlaththaik kazhikkinRIrE – wasting your time. As vishNu thathvam says “vichithrA dhEha sambandhISvarAya nivEdhithum I pUrvamEva kruthA brahman hastha pAdhAdhi samyuthA II”- this splendorous body with arms and legs was structured yugas (ages) ago to be offered to emperumAn. AzhwAr is asking, instead of attaining emperumAn and carrying out the appropriate kainkaryam, why are you wasting your time? emperumAn, who has left timeless SrivaikuNtam and taken position in this time-controlled world, is waiting for you all to attain him. But you people are wasting your time. While nithyasUris (vishvaksEnar, AdhisEshan, garuda et al, who are permanent dwellers of SrIvaikuNtam) are willing to carry out appropriate kainkaryam by knowing his desires, he has, forfeiting them, come here so that you people could take refuge under him. But you people are running after food and dress for the body and wasting your time. While he is waiting here so that he can slowly get you interested in him and he can train you to enjoy him, you people are holding onto everything except him. How sad this is, feels the AzhwAr. We shall proceed to pAsuram 12. This entry was posted in mudhalAyiram, thirumAlai on September 4, 2016 by T N Krishnan.